I’ve still got 3 (THREE!) papers due before the semester ends… and this is exactly whats gonna happen. Every. Single. Time. Spot on. This is so true. at least put your name down! I should get a few of these shirts printed and start wearing em all the time. i just want to let u know that i had to write a paper on 2 webcomics for english, and i chose 2 of ur comics. the topic? procrastination. its due tomorrow. u wanna know what my paper looks like? this comic here. HAHA! I know exactly what your going through. Its an honor to have my webcomic chosen. Let me know how what you get on that paper. aw yeuh. got an A. 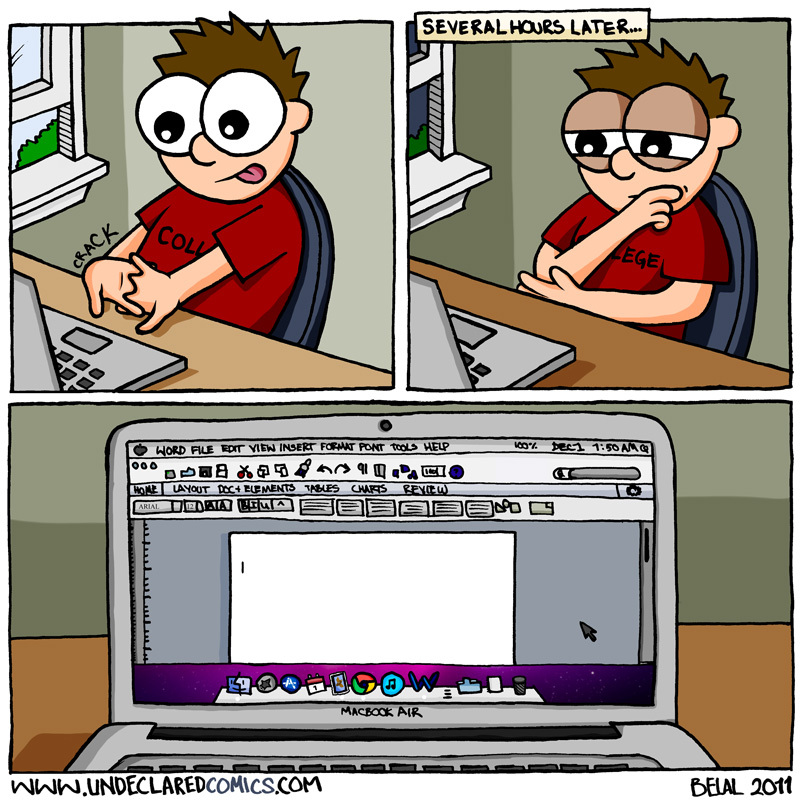 What assignment/class did you do concerning webcomics? Think three essays is bad? Try four. But even though all are due in the next two weeks, have I started on single one of them? Nope. Instead I’m reading your comic. Thanks for the excuse to procrastinate! I’m glad I haven’t had to write an actual paper this whole semester. However, all the programming projects I’ve had to do are pretty much the same way. Belal, I finally got through everything and into exam week. Best of luck! You’ll get past the blank pages and taste sweet freedom soon enough. Haha, two papers down… one more to go.